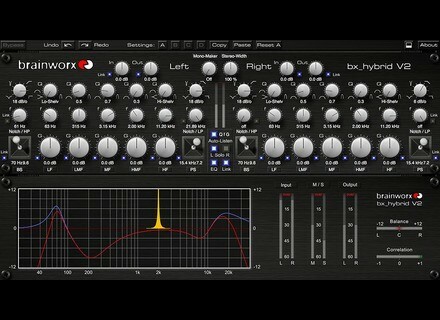 bx_hybrid V2, Software parametric EQ from Brainworx. Plugin Alliance announces the availability on its store of the V2 version of the Brainworx bx_hybrid 11-band EQ plug-in. 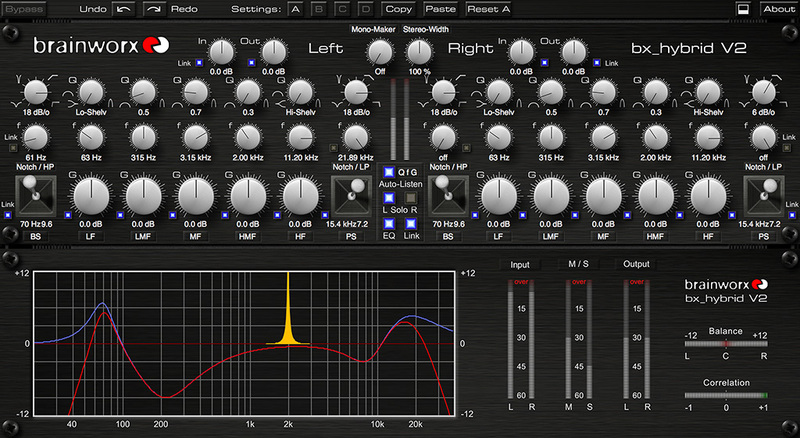 The Brainworx bx_hybrid V2 EQ was redesigned from the ground up using the latest analog-style filters of the brand. The plug-in is now available in AAX native/DSP, Audio Suite, AU, RTAS and VST2/3 versions for Mac OS X and Windows 32 and 64-bit. The bx_hybrid V2 features a 5-band EQ plus low and high-pass filters with adjustable filter orders (up to 5th order / -30dB/octave), low and high shelving EQs, peak filters, 2 notch filters with adjustable Q and Bass and Presence Shifter EQs that can be controlled using Surround Joystick or mouse. An Auto Solo mode is included for soloing single frequency bands and tweak Q controls. Brainworx add that Digidesign ICON controller users can map and control the Shifter EQs with the Surround Panners of the controller. Full automation is supported and a Mouse Over feature allows for adjusting the parameters by holding the mouse over any knob and turning the mouse wheel. bx_hybrid V2 is available for $199 at plugin-alliance.com. If you purchased V1 in 2013, the upgrade is free. Users of the Plugin Alliance ALL bundle can also get the plug-in for free. Upgrade for other V1 users is $48. Eventide starts to abandon the iLok The Eventide 2016 Stereo Room and Omnipressor are now available in 64-bit VST, AU and AAX formats and no longer require an iLok dongle. Toontrack Rock! EZX features 8 drum kits Toontrack launches Rock! EZX, a new drums library for EZ Drummer and Superior Drummer mixed by Neil Dorfsman. IK Multimedia iRig HD Review After Apogee, now it's IK Multimedia's turn to present an audio interface for the iPhone, iPod Touch, iPad, and Mac aimed at nomad guitarists.